Steering swivel pins may wear out after a high mileage (60,000 plus), or sooner if they have not been properly lubricated. A badly worn joint is dangerous - not only does it make the steering wander, but it may suddenly fail altogether. Worn joints need special equipment to replace and the work should be done by a garage, but you can check them yourself. You need a helper and a long flat, steel bar such as a large tyre lever. Make sure the car is on level ground, put the handbrake on firmly, and the car in first gear if it is a rearwheel-drive model. Put a car with automatic transmission in 'P' or 'park'. 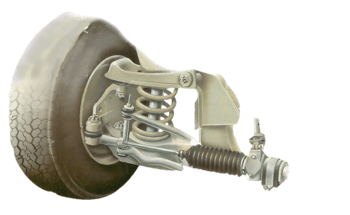 Chock both rear wheels, then jack up the car to raise one front wheel, and put an axle stand under a chassis member, so that the other front wheel remains firmly on the ground. Never work under a car when it is supported only by a jack. Always use axle stands placed under a strong chassis member. First inspect any rubber dust seals or covers on the swivels for signs of perishing, cracks or splits. If you find any, almost certainly dirt or grit will have entered the joints, they will be damaged and they must be replaced. Some cars have rubber or nylon bushes inside various joints in the top, bottom or both swivel pins. So far as these are visible, check them for perishing, cracking or softening caused by oil. If they are not visible, excessive wear or damage will show up anyway in the routine test. Here, too, any damage calls for replacement. A MacPherson-strut suspension has its top swivel bearing inside the strut. Inspect it when you check strut mountings (See Checking suspension joints and pivots). The bottom bearing can be checked, however. Place yourself where you can see clearly the top and bottom swivel pins and the steering swivel member that joins them on the suspension that has been raised. Ask your helper to grasp the wheel firmly at top and bottom, and rock it by pushing with alternate hands use a fair amount of force. The wheel should move a little, because of free play at the hub bearing (See Adjusting wheel bearings). This play makes the brake disc or drum move relative to its backplate, and is easy to see. Watch the top and bottom swivels and steering swivel member. If the joints are worn, you can see the swivel member move in and out in relation to the top or bottom suspension arms. Watch the joints while a helper rocks the wheel. Levering the tyre up and down. To test for vertical play, put a screw or hydraulic jack under the lower suspension arm, and raise it until the suspension is compressed. Again, watch from where you can see both top and bottom joints. Get your helper to put a strong lever or bar under the tyre and move it up and down while you watch for movement at either joint. Some ball joints have spring-loaded pins which allow a small amount of vertical play, generally no more than in. (1.5 mm). Anything greater means a worn joint. If the maximum permissible play is not in the car handbook, consult your nearest agency. If the pins are not spring-loaded, any visible play means that they are worn and must be replaced. The upper swivel is at the top inside the wing, and is not visible. Only the lower swivel joint can be checked for play. With the front of the car raised so that the wheel hangs free, ask your helper to hold the wheel back and front and rock it from side to side. If the joint moves at all, vertically or horizontally, it is defective and must be replaced. The steering may deflect a little during this test; take care not to confuse this with play at the joint. Check for vertical movement also by resting a lever against the inner wheel rim and pushing upwards against the joint. 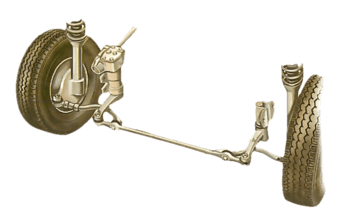 MacPherson-strut front suspension can be found on both front-wheel and rear-wheel-drive cars. Here it is on a front-wheel drive. Helper rocks the wheel from side-to-side. Lever the lower arm against the wheel rim while watching the joint.